His approach is programmatic and cohesive, which is critical for BC teams today to achieve success and support from executive management and all business units. 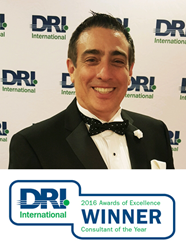 Christopher Duffy, vice president of consulting at Strategic BCP, was named “Consultant of the Year” by Disaster Recovery Institute (DRI), under its 2016 International Awards of Excellence program. The program recognizes individuals and organizations for outstanding continuity management, technology recovery, and crisis management. Finalists in this award category included Booz Allen Hamilton and CSC. The dinner and award ceremony took place on Tuesday evening March 8, 2016 at the Hyatt Regency Atlanta where DRI’s Annual Conference was being held. DRI’s selection of Duffy was based on customer endorsement, objective industry opinion, and examples of the tenets contained within DRII's 10 Professional Practices. DRI also factored his imaginative ideas to resolve issues, resourcefulness and innovation in the actual techniques used, the initiation of a business continuity culture in all the organizations involved, the strengthening of relationships between service suppliers, insurers and business continuity professionals, and creative ideas on future developments in business continuity planning. Christopher Duffy (CISSP) leads Strategic BCP’s advisory and consulting practice. He possesses over 25 years’ experience in IT management, disaster recovery, business impact analysis, and the development and creation of business continuity plans. His hands-on experience includes roles as senior consultant with the City of Philadelphia, Florida's Tallahassee Memorial HealthCare, the New Jersey State Motor Vehicle Commission, and the South Carolina Department of Education. Prior to these roles, Duffy also served as CIO for Peirce College in Philadelphia. Duffy will join Strategic BCP client Lori Norman from WEX Inc. during a breakout session at the Continuity Insights (CI) Management Conference on April 20, 2016. They will present “BIA Paradigm Shift: Ensuring Success Utilizing a Value Stream Approach”. This emerging approach places an emphasis on business process mapping surrounded by key executive metrics, risk management, and a focus on real-time resilience. Strategic BCP® is an award-winning Business Continuity Risk Management company named “leaders” by Gartner two consecutive years. Our software, ResilienceONE®, automates cumbersome tasks to make risk-based decisions for managing BC, IT and Enterprise, and 3rd Party Vendors from a single solution. Our consulting arm helps convert typical BC functions into a “value stream” approach that ensures success and accountability at every stage—allowing BC teams to become their C-level’s most trusted advisor.